After saying good-bye to Luxor, I headed further south to the city of Aswan. 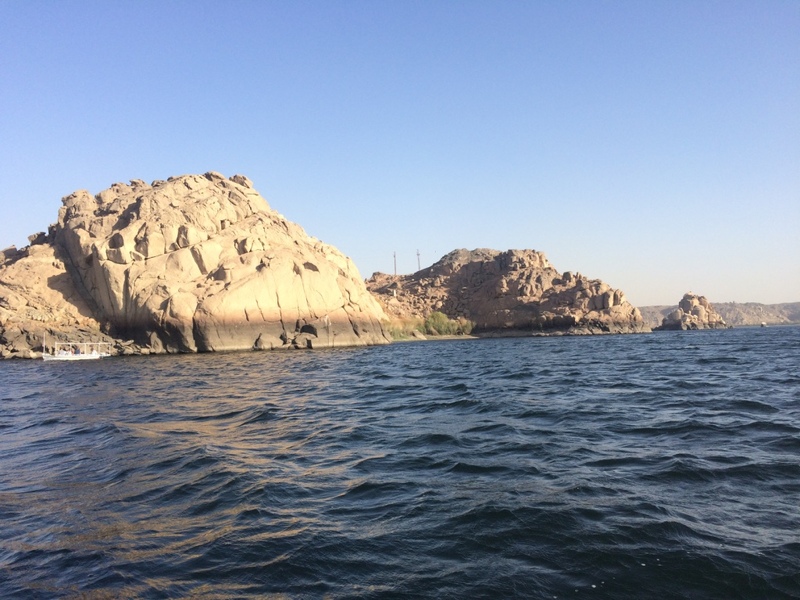 Aswan is a city in the super-south of Egypt, also along the Nile River. 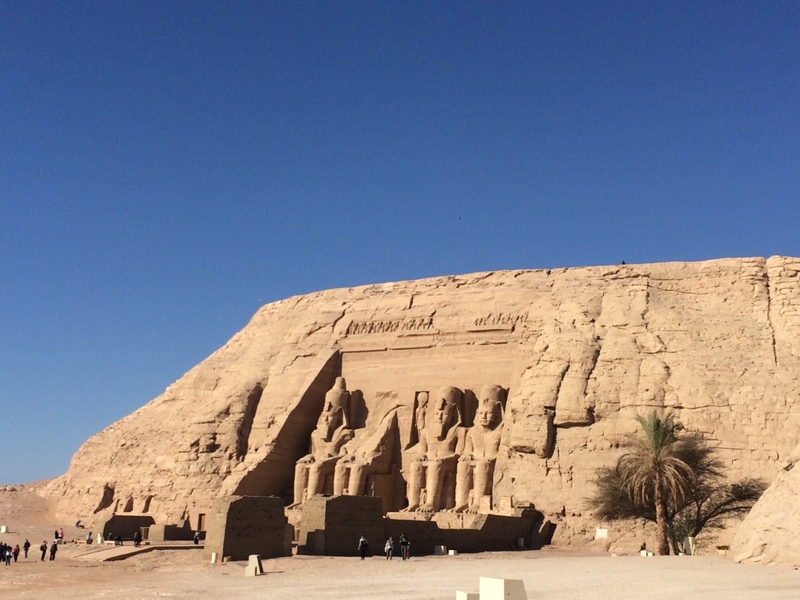 It's a pretty city, but is most-often visited by tourists as a jumping-off point to visit the temples of Abu Simbel. Abu Simbel is a series of temples built by Rameses II (obvs) that are carved into stone and are amazing. 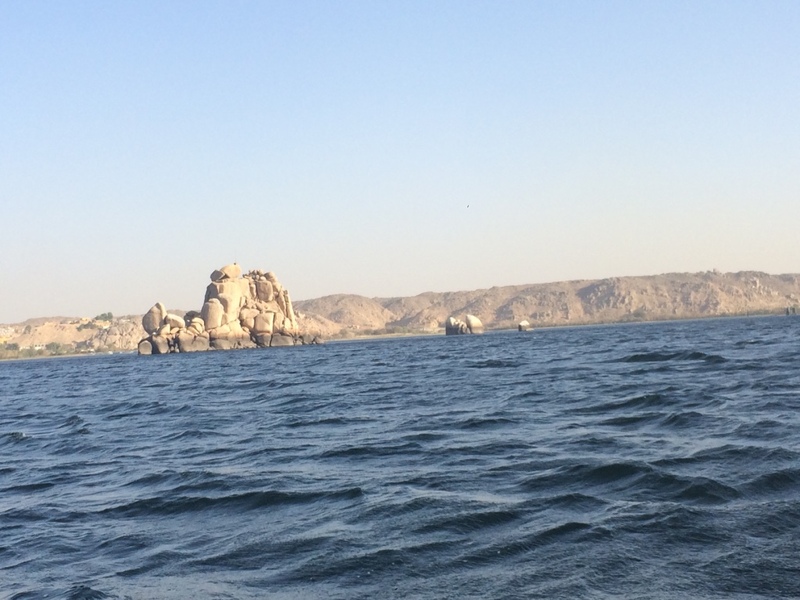 As a side note, another popular option with tourists is to sail on the Nile from Luxor to Aswan, or vice versa - it's apparently gorgeous and relaxing and life-changing. I didn't have enough time, so I took the train, but it's going on my list of to-dos when I return to Egypt. As if I don't have that list for every country I've visited. Can I just travel forever? 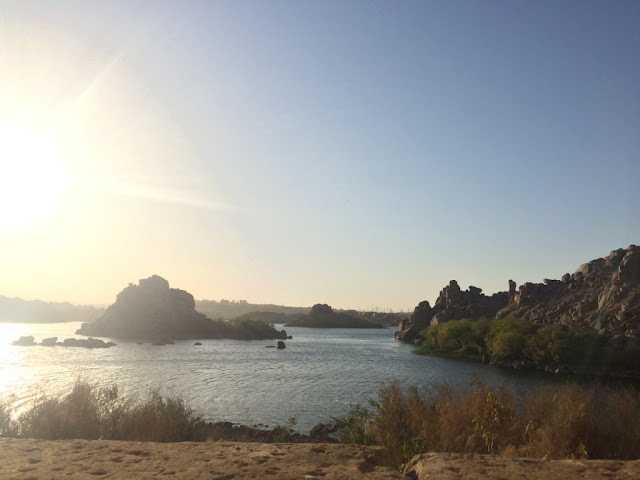 One 3-hour train ride later, I was picked up in Aswan by a new guide, who immediately whisked me away on a quick tour of Aswan. On the way, he picked up another traveler, and off we went. 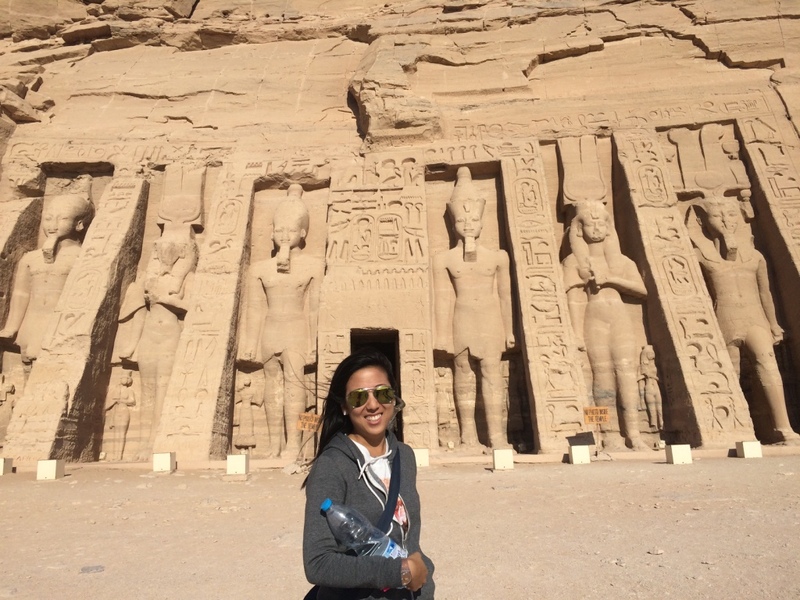 I swear, I randomly booked a tour of just Luxor/Aswan through my hostel in Cairo, and there was no information at all. I had no idea what was happening half the time; random people would just show up and randomly take me places and tell me what time to be where. 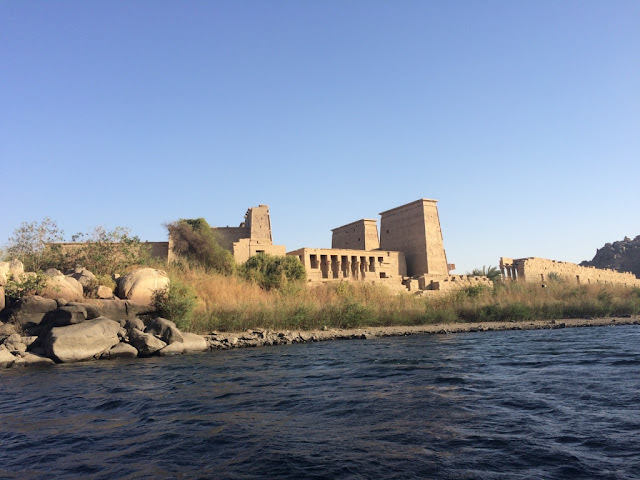 We visited the Aswan Dam and a temple on the water called the Philae Temple. And here is Philae Temple on its new island! Built around 380 B.C., the temple was thought to be the resting place for the god Osiris. And of course, at some point the Coptic people came in and tried to turn it into a Christian church. 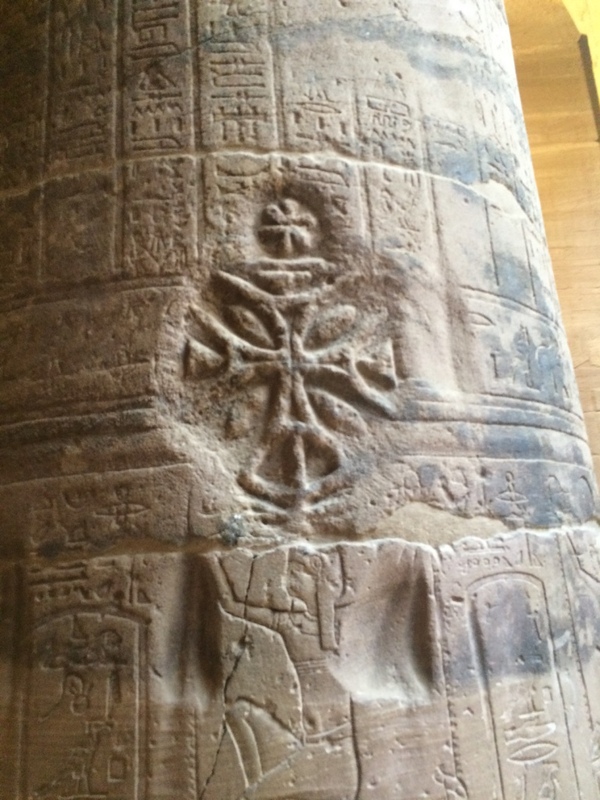 So there are Coptic crosses carved everywhere over the hieroglyphs. Fancy outside hieroglyphs. The temple has Greek influences because the bodies are more shapely than typical Egyptian temples. I think that's what the guide said, anyway. 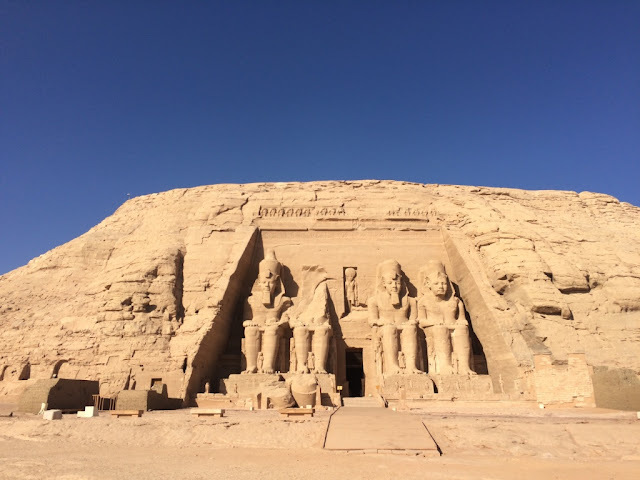 The next morning, a 2:45AM wakeup call meant I was herded into a van with a bunch of people; we headed further south to the temples of Abu Simbel (the journey from Aswan to Abu Simbel takes another 3 hours). 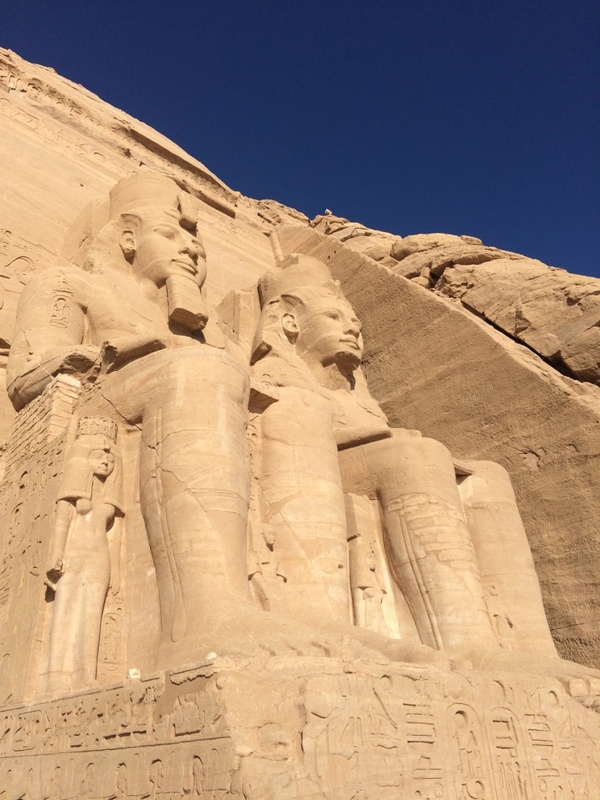 Fun fact, Abu Simbel is so south, that it is only about 75km from the border of Sudan. 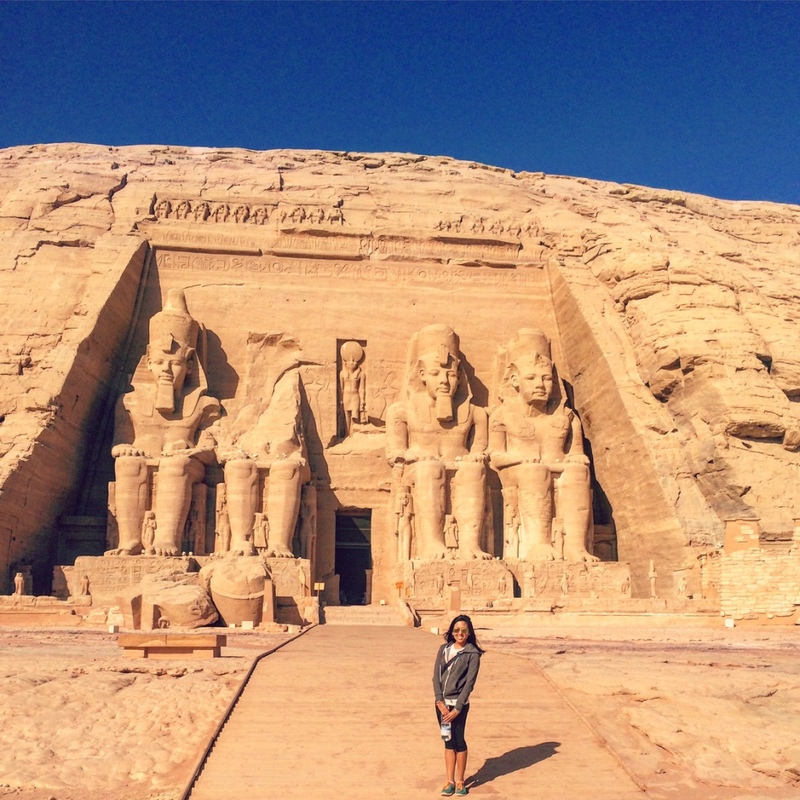 AND HERE IS THE MAIN TEMPLE OF ABU SIMBEL! ARE WE AMAZED. IT WAS HUGE. This is the Great Temple of Abu Simbel, which was built by Rameses II and basically a structure he erected to show off how great he was and impress Egypt's neighbors to the south. You couldn't take photos inside so can't show you those, but can tell you there's basically HUGE scenes carved on the interior walls of him winning battles and being blessed by gods and basically just being super-great and amazing at everything. Outside the main temple, he erected four giant seated figures of himself. This man seriously, seriously loved himself more than anyone I've ever heard of. 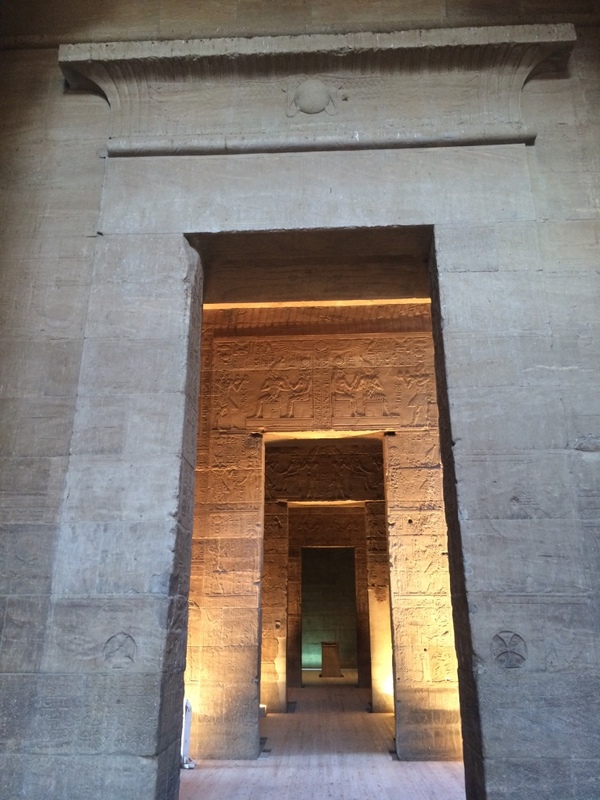 The temple's back wall features three seated statues of the gods sitting next to Rameses himself - it's perfectly positioned so that the statues in the back of the temple are perfectly illuminated on dates of special significance (with the light lingering longer on the Rameses statue, and not illuminating the statue of the God of the Underworld at all). It's crazy. Ancient Egyptian architects are the most baller people ever. 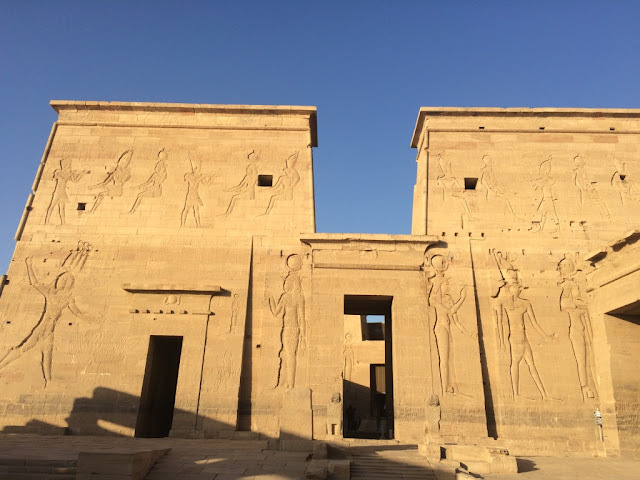 Outside the temple dedicated to his wife, Rameses II still managed to erect huge statues of himself as well. There's a statue of her as well, but this man is relentless. And my new hero. The temples were both moved by UNESCO in 1960 due to the flooding from construction of the Aswan Dam. It took only 4 years and $36 million dollars. THAT IS CRAZY. How did they move these entire temples?!?! So impressed, UNESCO. Points for you. To be totally honest, not a day has passed in Egypt that I haven't been truly heart-touched by a local here. I feel like a lot of them go out of their way to look out for me and make sure that I feel safe and have a great time, and I cannot count the number of locals that have been truly, truly amazing to me. That, and Egyptian men just seem to kind of be suckers for women in general. I would give everyone an MVP if I could; for serious. I'm now coining a new term "traingels", which is basically short for "train angels," because IT IS A THING. Keep in mind that the trains here are crazy, usually packed, full of men shouting and locals hauling on giant boxes and men selling things, and it's kind of pure chaos. Top it off with the fact that it is not that common of an occurrence to see a tourist on a train, and I feel like people see me at the train station and just want to help. On the train from Luxor to Aswan, I was seated next to a slick-looking businessman in his 40s. This man asked me where I was from, and not only did he look at my ticket and keep an eye out for my station for me, but he also made sure my stuff was secure, always shut the train door for me when men were smoking outside, and went to the tea cart and bought me a tea. At one point, I was sitting there and he was on the phone, and he handed the phone to me and goes "my wife wants to talk to you." Sure. Over the phone this man's wife used her (incredibly sweet and broken) English to excitedly ask me questions about myself. After I handed the phone back to the man, he chatted for awhile, hung up, then turned to me and goes, "My wife loves you." He then spent the rest of the time showing me photos on his phone of his entire family - especially his three kids, whom he seemed to be especially proud of. As I disembarked from the train after a 3-hour ride, the man wrote down his info, told me to call him if I ever needed anything, and made me promise to friend him on Facebook. MELT. Crazily enough, the next day on the train from Aswan back to Luxor, the same thing happened. I'm 99% sure my guide didn't purchase me a seat on the train until it was too late (Star he was NOT), so there were no seats left. He didn't explain this to me, but shoved cash into my hand, asked a local man on the train to look after me, and then bolted. This local man took it seriously. He seated me next to him (which turned out to be SOMEONE ELSE'S seat because I apparently didn't have a seat! ), and he calmly negotiated with the other man until the other man left so that I could stay there (I swear I offered to get up and the man wouldn't let me). He switched seats with me and gave me his window seat so that I wouldn't be bumped by all the passing vendors. Halfway through, he reached into a plastic bag and produced a roll of cookies to give to me. He had his own roll of cookies and we munched them together on the noisy train, and it was the CUTEST. He didn't speak much English, but he also pulled out his phone to show me a family album of all his kids and his wife. And then he also bought me a tea from the tea cart and refused to let me pay. MELT. To my two wonderful traingels, you both get MVP status. They both seriously made my day - small gestures like these touch me more than anything, and the unexpectedness of it was what I loved most. 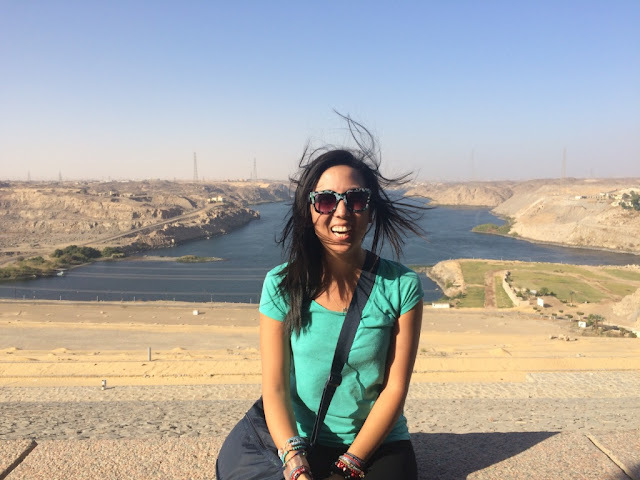 This is also part of why I am loving Egypt - it is gritty, chaotic, pushy, and overwhelming on the surface - but just beneath are the most beautiful people ever. I am now gushing. End gush.